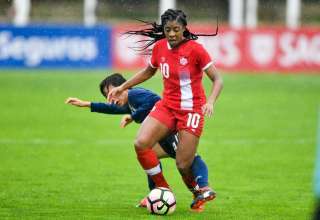 Canada will likely go into its final group-stage game of the U-17 Women’s World Cup without any pressure. 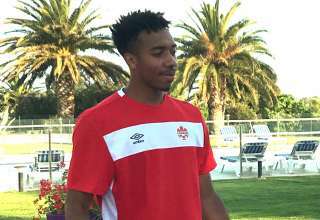 Thanks to second-half goals from Jordyn Huitema and a screamer from Lara Kazandjian, the Canadians triumphed over South Korea 2-0, and have almost clinched a spot in the quarterfinals of the tournament in Uruguay. The only way the Canadians can miss is if Colombia upsets Spain later Saturday, then beats South Korea on Nov. 21. Canada would also need to lose its final game to Spain and blow a massive goal-difference advantage. Canada is at +5 right now. So, Canada has one foot and pretty well all of the other in the quarter-final round. For Huitema, it was an eventful second half. She was involved in two key incidents sandwiched around her opening goal. The second half opened 0-0 after what was a mostly harmless first 45. But Huitema collided with Korean keeper Jiyeon Kang just a minute after the restart. It wasn’t a dirty play by any means, but Kang’s head bounced off the much taller Huitema’s shoulder. Now, I’m not an expert in head injuries, but Kang certainly didn’t look assured after taking that hit. For sure, there’s an argument that the mistakes she made after the Huitema collision could be chalked up to her youth and the pressure that comes with a World Cup; but I wouldn’t be doing a fair analysis of the game if I didn’t mention the Huitema-Kang incident. The first signs that the Korean keeper wasn’t on her A game came when Kazandjian floated free kick into the box that should have been an easy, unchallenged catch for Kang. Not only did she drop the ball, but it veered right towards the goal after it bounced off of her hands, with a defender getting there in time to clear the ball off the line. The goal came soon after. Off a corner, Kang came out to punch, but she only managed to push the ball towards Huitema, whose volley attempt soared high in the air, but dropped neatly over the goal line. With the keeper still trying to scramble back towards the line, the goal felt like it was happening in slow motion. But, just before the 70-minute mark, Huitema was sent off after a head-to-head clash with Mini Kim. Both players were down for several minutes, but the referee felt that Huitema was the antagonist — and issued a red card. Huitema will miss the group-stage finale against Spain, at least. But, down to 10 players, Canada got its second goal to kill the game, with Kazandjian rocketing a shot from distance that beat Kang cleanly.